Playlist blogs are emerging as a distinct subgenre of MP3 blogs. As part of this they are taking on a common layout. Date and time the post was created. An image related to the mood or theme of the playlist. Sometimes (2/4 cases) with “(release information)” appended. A paragraph or two of prose. The traditional footer of a blog post. This usually includes a permalink to the post and the date and time that the post was created. 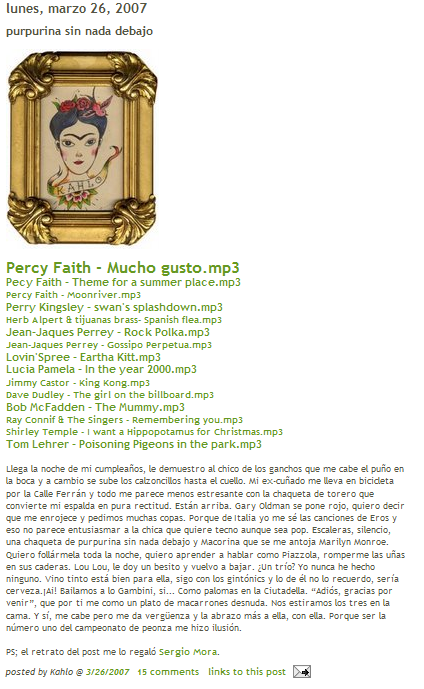 In all cases the blog home page incorporates the full text of the playlist inline rather than linking off to a separate document. When you write “taking on a common layout,” you mean: a content convention for playlist blog posts is starting to emerge? Not: someone is calling this convention a standardized format and promoting that bloggers take it on? The first — a convention or idiom for how to lay out the content, rather than a standardized format. There are few more playlist blogs. But overall a regular playlist blog is fairly rare. Almost every big players post at MdM. eg. Music is art is another site. The rest is DJ’s site.